Scenes from Fervor, clockwise from top left: cutlery chandelier, the bar, signage, red menu. Being back in Buenos Aires is like being back home (my second home, that is) and is always a pleasure to visit even for just a week. On this trip, we had our first Sunday lunch at our all-time favorite parrilla – El Mirasol. As always, it was packed with families enjoying the grilled meat and convivial atmosphere. 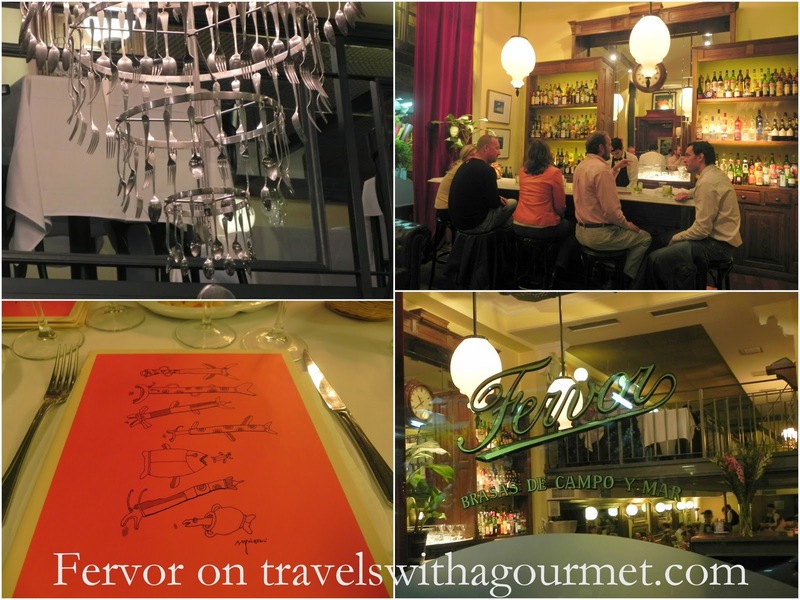 On Monday evening, my Mother-in-law invited us to try Fervor, a relatively new parrilla for dinner located on Posadas street right smack in the middle of chi-chi Recoleta. Fervor is owned by the same people who run the Italian restaurant Sottovoce (another one we regularly visit and where we had dinner on Sunday evening). The restaurant is right beside a street-side flower stall which makes the entrance colorful. Interiors are bistro-like and done up in red (velvet curtains, menu covers, leather banquettes) and black (chairs and tiled floors) with an interesting tiered chandelier made up of cutlery hanging upside down (good thing there were only spoons and forks as sitting underneath knives would have been too risky). 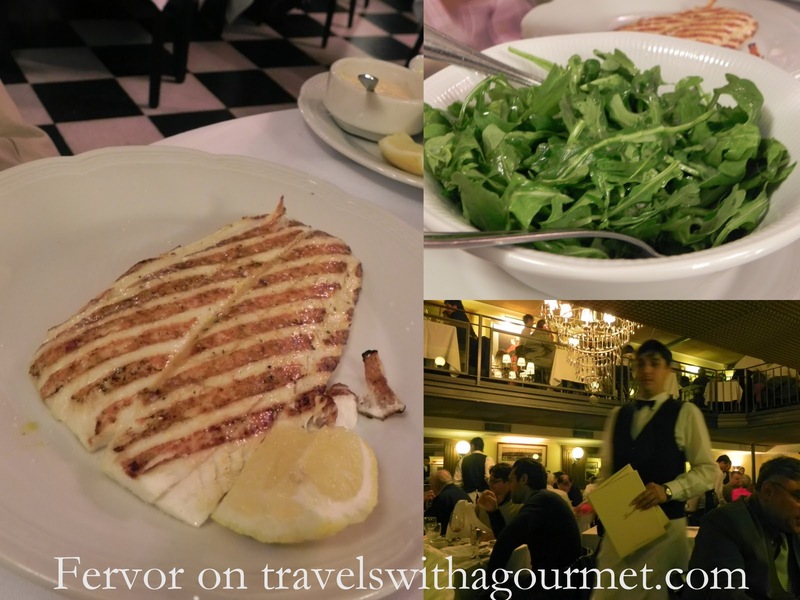 The menu is simple – charcoal grilled meat obviously but also fish and seafood which is quite unusual in meat-centric Argentina, but a nice change for non-carnivores. The place was half-empty when we arrived at around eight. We were seated in a banquette on the lower floor (the place to be) and were in a cozy corner table which afforded us a view of the entire room and lots of people watching. After looking at the menus, my two Porteño companions (A and his mom, An) ordered lenguado (sole) and brochette de langostinos (prawns). I, on the other hand, couldn’t resist another chance to eat Argentine beef and chose the 400 gram ojo de bije (rib-eye), medium rare. Two side dishes that we would share were also ordered – an arugula salad and some Provencal french fries along with a half bottle of Malbec. Slowly, the place started to fill up with an older, international crowd, although there were also quite a few locals and for a Monday evening, it was pretty packed. By the time our dinner was served, there was hardly a table free and the atmosphere was quite lively – noisy with cutlery and glasses clinking and lots of diners tucking into large hunks of meat. A bowl of assorted bread was set down on the table along with some sauces – chimicurri and salsa criolla for the meat and a trio of sauces for the fish – tartar, lemon and a slightly reddish spicy one. The portions were good – more than a dozen grilled prawns on an oval plate, a slab of striped-from-the-grill fish with a wedge of lemon and a marbled slab of charred rib-eye. The salad was bitter and sour with the lemon dressing and the fries were a mound of hot, crunchy, garlicky goodness – the perfect accompaniment to my steak. I thought that I would never be able to get through that piece of meat but I managed to eat it all and just give A a couple of bites to taste. For dessert, I had some homemade ice cream – dulce de leche and chocolate for me and A and the almendrado for An. 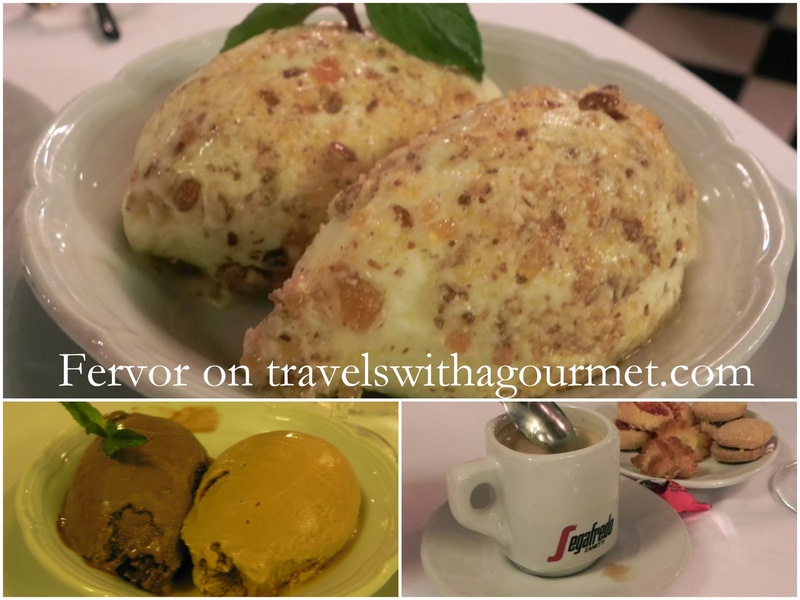 The ice creams were creamy and delicious and the almendrado was a tasty discovery for me – crema americana (a typical Argentine ice cream flavor of frozen cream) studded with crushed toasted almonds. The usual espressos to end the meal and a quick walk up the street to catch a cab home. Fervor was the first new Buenos Aires restaurant we tried on this visit and the second best meal I had on this trip (the first was Michael’s in Miami). I hope that on our next visit, more new restaurants like Fervor crop up on the scene, where the design and atmosphere is the same level as the food being served.